Orange County has a new indoor trampoline park in Laguna Hills, and you’re gonna wanna check it out! Big Air Trampoline Park is for the youngsters as well as adults. Located off of the 5 freeway in Laguna Hills, Big Air Trampoline Park is convenient from all over Orange County. 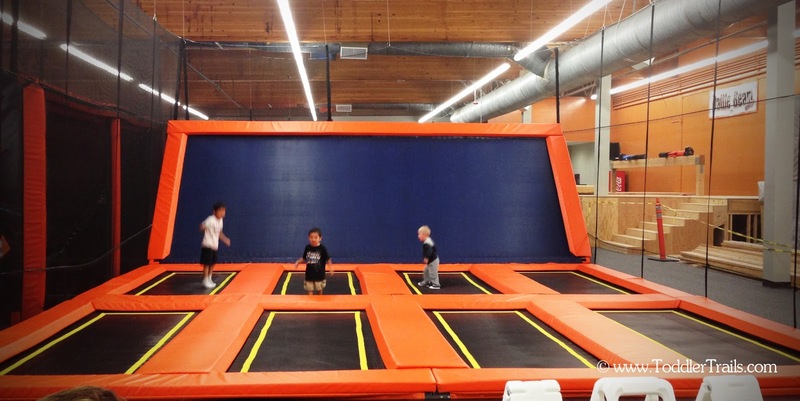 With 17,000 square feet of jumping surfaces your family will be thoroughly entertained. From trampoline dodgeball courts, slam dunk courts, foam pits, launch pads, a rock climbing wall, battle beam and massive freestyle court, there is tons to do at all ages. 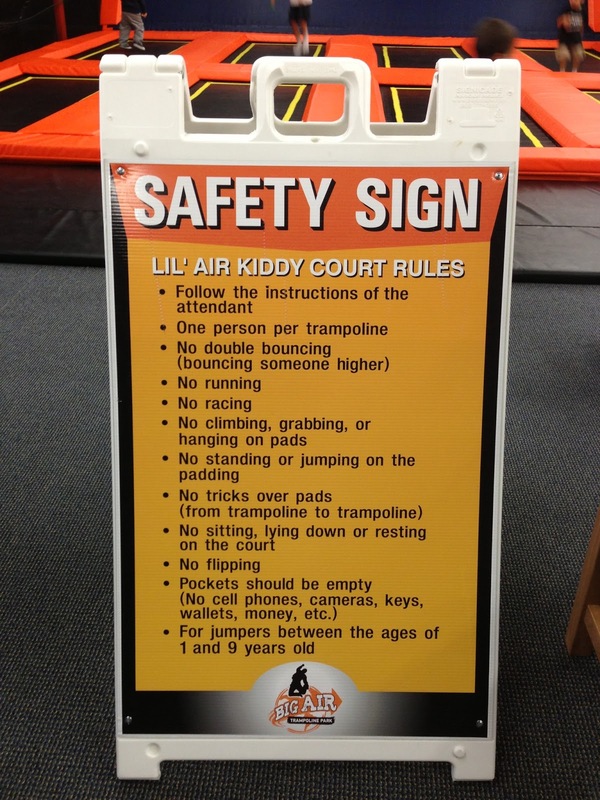 Lil’ Air Kiddy Court is designed for kids 1-9 years and is open play. Here they can bounce, jump, chase and do whatever they want without big kids running into them and knocking them over. Little jumpers are also permitted on the larger open trampoline area also. This was the area my kids liked the most. They were able to run and jump, make it an obstacle course, even practice ballet leaps from square to square. #1 priority for Big Air is safety. Throughout the park you’ll find safety signs, reminding jumpers that there is no racing, jumping, climbing, etc. There are different signs posted for each jump surface, so as no one gets hurt. There are parts of Big Air that are still under construction. They will be one of the first trampoline parks to have a climbing rock wall, where you can fall into a giant foam pit – also two options will be available, one for younger climbers that isn’t so steep. There is also a “Battle Beam” in the making. This will be the first ever competition based on American Gladiator style bouts. Valid for US Residents only. Winners will be randomly selected via RaffleCopter and be notified via email. They have 48 hours to respond or a new winner will be randomly selected the same way. Give-away winners an email on how to claim their tickets. Groups of 4 get in for only $32 and receive a FREE hot dog + chips + soft drink for each jumper! Additional jumpers are only $8 and also receive the free meal. Available all day Monday! Group rates are available for different sized groups and are sold in 1 hour time slots. Reservations a week in advance is required as they sell out fast. A non-refundable deposit of 50% is required at booking. Bounce Fitness and Bounce Boot Camps are cardio and muscle toning workouts that are fun. Keep your heart rate in your “target zone” for longer periods of time, causing the body to burn more calories than running. Classes are available Mon, Wed, Thrs at 8:45am and Mon & Wed nights at 8:15pm. Cost per class $10 or $40/month. 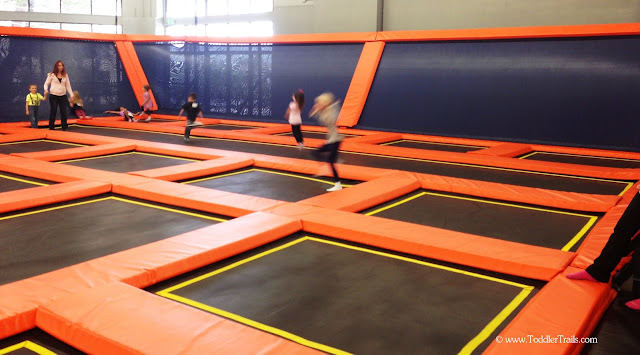 The newest craze at trampoline parks is Dodgeball. Big Air is just starting up their first Dodgeball league where 8 teams will compete for 8 weeks. Matches are 8 minutes long and it is a 7 week season with each team playing 3 matches a night. The final week is a double elimination championship tournament. Cost: $12/person, $96/team. A variety of different birthday packages are available with discounted rates Mon-Thrs. Visit www.bigairoc.com for more details. Thank you to our friends at Big Air for allowing us to spend a day jumping and touring the park. Even though we jumped for free, all of the opinions are my own.